The Turkish lira has taken a heavy pounding recently as investors have started to doubt the country’s creditworthiness and economic outlook. At the time of writing, the value of the currency has collapsed to 0.16 against the USD – down almost 40% since the beginning of this year. Sentiment has soured towards the lira, pushing the currency to a series of record lows and sending a shockwave through the financial markets. In this week’s ‘Graph of the week’ I provide an overview of the potential impact of Turkey’s currency crisis. Obviously, the sharp depreciation of the lira is having a profound impact on Turkey itself. Currency weakening has a number of adverse effects, which can easily result in negative feedback loops. 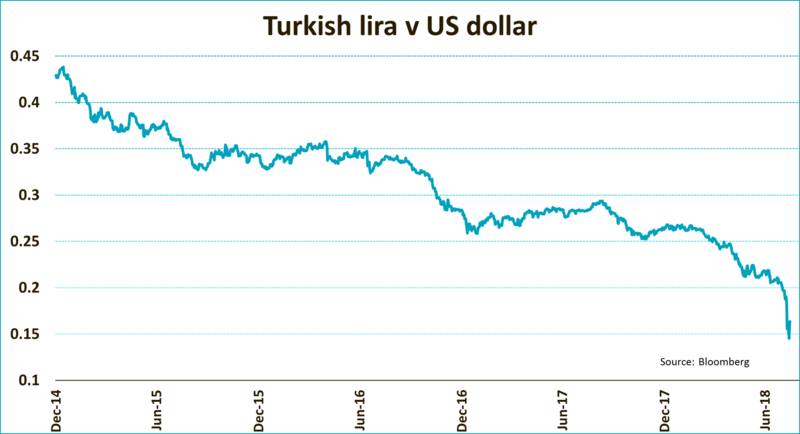 First, the lira’s dramatic fall will make it more difficult for Turkey to repay its foreign currency-denominated debt. Recent data shows that the country’s external debt-to-GDP ratio is above 50%, one of the highest levels in emerging markets. As the amount of debt, measured in local currency, rises, so too does the probability of default. Over the last month, the implied default probability has roughly doubled to just under 30%. As a result, rating agencies have put Turkey on their watch list for a possible downgrade, placing more pressure on the currency. 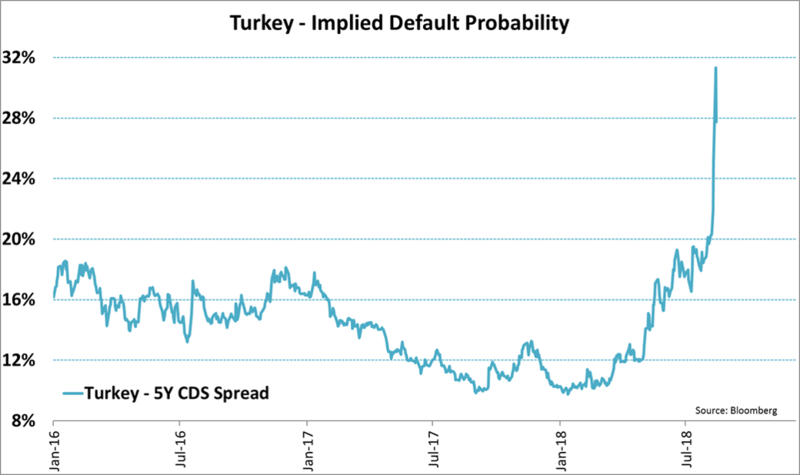 Second, the rising risk of default is having a negative impact on the market value of Turkish banks. The banks are seeing a rise in the value of ‘non-performing loans’ – loans that are unlikely to be paid back in full. Non-performing loans hit banks’ capital reserves. 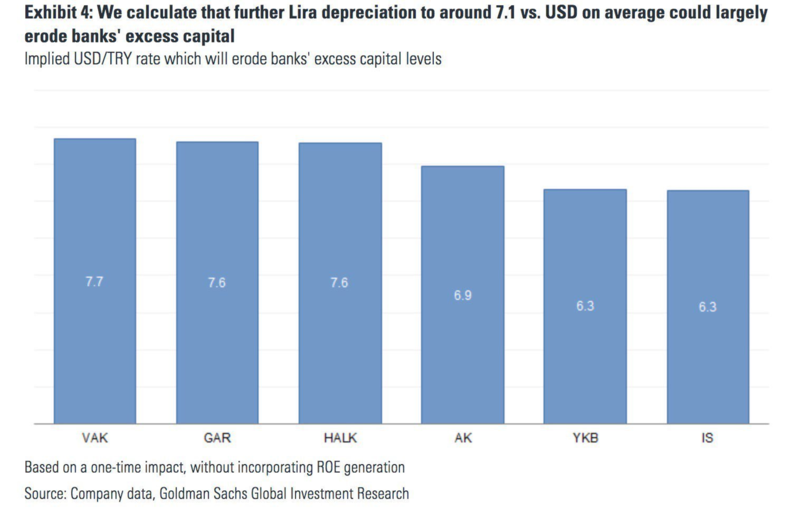 Goldman Sachs has in fact estimated that a fall in the lira to around 0.14 against the US dollar (USD/TRY inverse of 7.1) may completely erode the excess reserves of the Turkish banking system. This will limit the ability of banks to issue new, better-performing loans, which in turn will hit GDP growth. In addition, Turkish bank share prices are likely to continue their recent downward slide. A third impact is a rise in inflation from the current elevated levels. 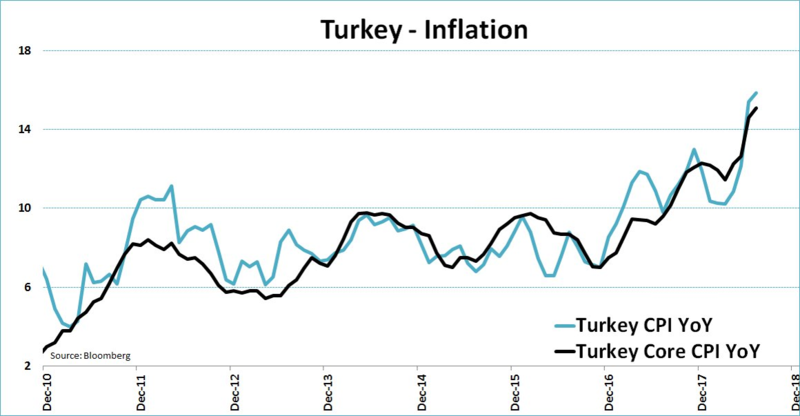 In July, Turkey’s headline inflation rose to almost 16%. But since the beginning of this month, the Turkish lira has shed another 20%, putting more upward pressure on consumer prices. Higher inflation will affect the purchasing power of Turkish consumers, resulting in lower GDP growth. 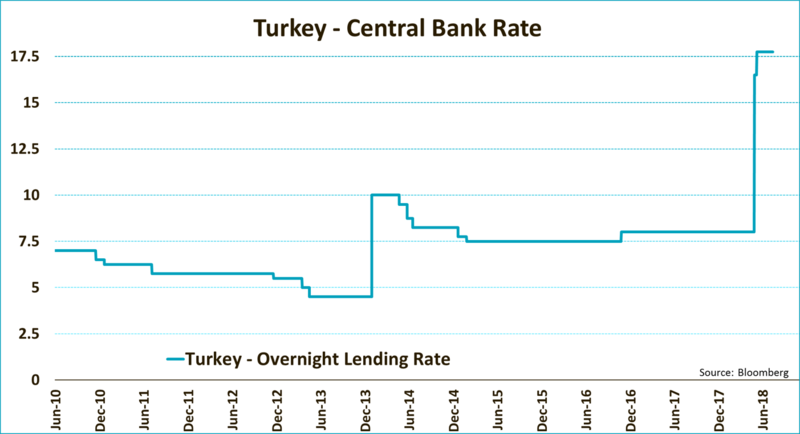 Finally, even though the Turkish central bank and government have so far refrained from raising interest rates, it seems highly unlikely that Turkey will be able reduce the pressure on its currency without increasing them. Higher rates would not only make investing in Turkey more attractive on a relative basis, they would also increase the cost of betting against Turkey’s currency. Historically, raising short-term rates has proven one of the most effective ways of halting currency depreciation. Higher interest rates, however, come at a price: GDP growth. A recession in Turkey can’t be ruled out at this point in time, despite the fact that the economy grew more than 7% YoY in the first quarter. Turkey is a somewhat isolated case to date. The combination of political uncertainty, US sanctions and an apparent unwillingness to take drastic measures are specific to the country. Turkey is also the only major emerging country with both a high ratio of external debt to GDP ratio and a large negative current account balance. Unfortunately, this does not mean that other emerging markets are immune to the developments in Turkey. In particular, countries that share some of Turkey’s characteristics, such as large foreign debt and economic imbalances, have been adversely affected. Argentina is a good example, although it has raised rates and asked the IMF to step in. But countries like India, where the political and economic circumstances are very different from those in Turkey, has also experienced significant market declines recently. Potentially exacerbating the impact is the fact that many investors see emerging markets as one asset class. So, when sentiment turns sour, they don’t discriminate between countries or regions, but sell the entire asset class instead. As an example, the JP Morgan Emerging Market Currency Index, which reflects the value of the bigger emerging currencies against the US dollar, has recorded heavy losses as investors have sold their local currency emerging debt. This despite the fact that the fundamentals of countries like Mexico and Malaysia have little to do with Turkey. A recent statement from the ECB, in which it expressed concerns about the exposure to Turkey of some Eurozone banks, immediately raised questions about possible contagion. As the graph below reveals, that exposure is mostly concentrated in Spain and – to a lesser extent – France and Italy. The number of banks mentioned by the ECB is small, as is their exposure (at least on average) when measured against their total balance sheet. This does not imply that Turkey should be ignored, however. Since bank balance sheets involve leverage, the impact on the banks’ common equity (CET1 = common equity tier 1) could be larger than just their stakes in Turkish banks if write-offs are necessary. For most Eurozone banks, however, local market circumstances are much more important. 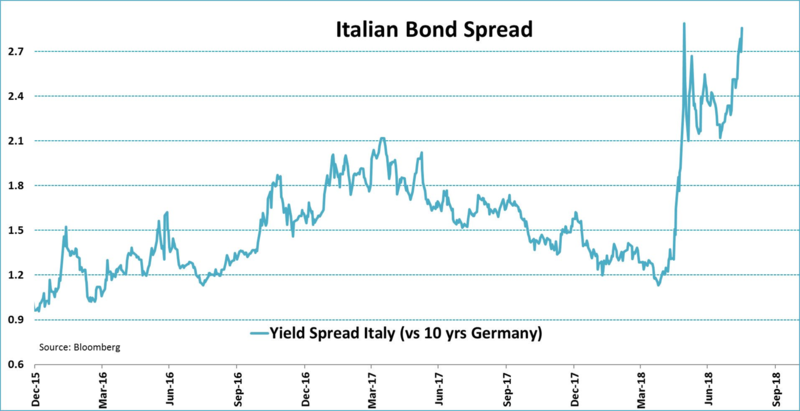 In the case of Italian banks, the recent sharp rise in Italian government bond yields has had a bigger impact on bank balance sheets. In that respect, the new government’s first official government budget – to be presented next month – is of more importance and could potentially cause an increase in volatility. Obviously, though, ECB concerns about exposure to Turkey – albeit it relatively small – would not be convenient if volatility does rise. To be clear, Turkey represents just a tiny part of global financial markets. 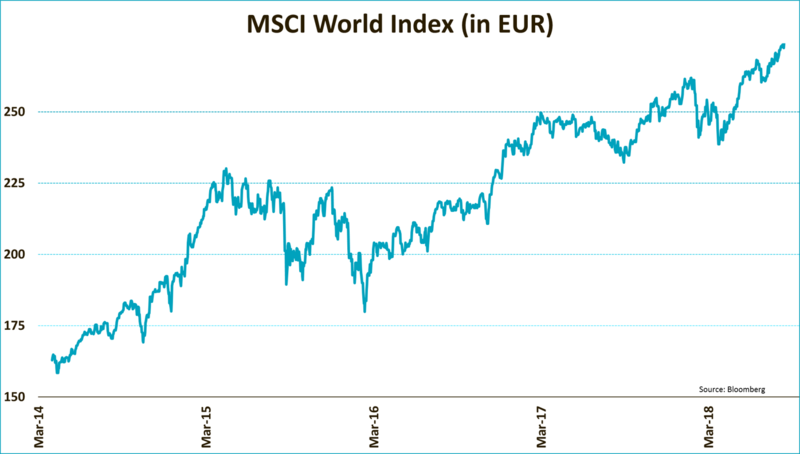 The weight of Turkey’s stock market in the MSCI Emerging Markets Index is just 0.6%, and roughly ten times less in the MSCI World Index. And while Turkey is of some more importance for fixed income markets, its share in these is also small. From an economic viewpoint, Turkey makes up 0.6% of Eurozone GDP. Hence, Turkey alone is therefore unlikely to derail global financial markets. The global economy remains in a healthy shape. 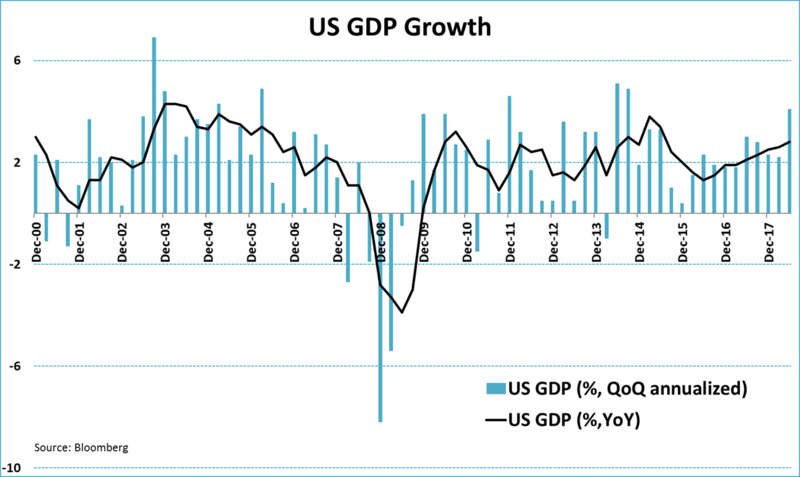 The US economy is doing particularly well, something that’s not likely to change in the short term. As a result of solid GDP growth, unemployment rates have fallen to historically low levels and corporate earnings are growing at the fastest rate in years. All of these developments are good news for emerging countries as well. But this does not mean we should underestimate the risk of contagion. During the last week or so, we have seen a clear difference between the performance of emerging market assets and the performance of developed market assets. Some caution towards emerging markets is warranted. However, we also need to keep an eye on the underlying fundamentals. 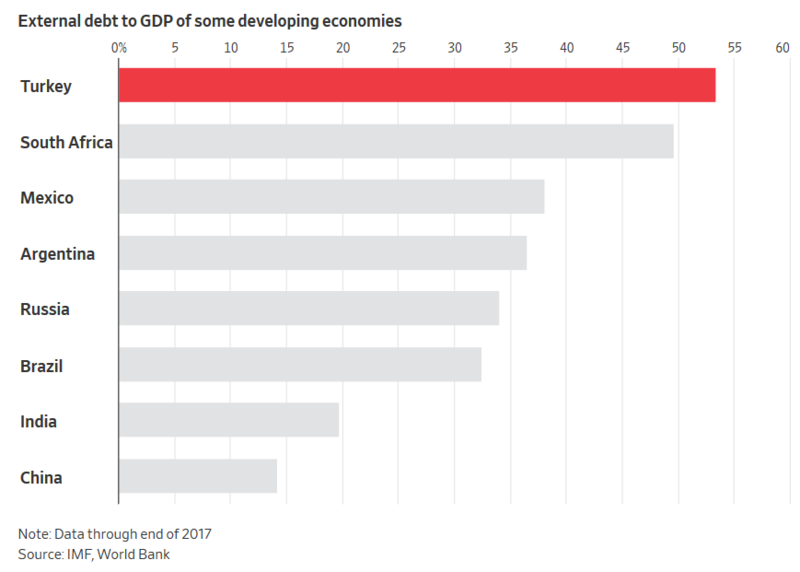 Generally speaking, emerging economies are in better shape now than in the run-up to previous emerging market crises.